I came to the idea of doing this project while researching another project on prison inmates, who train service dogs. 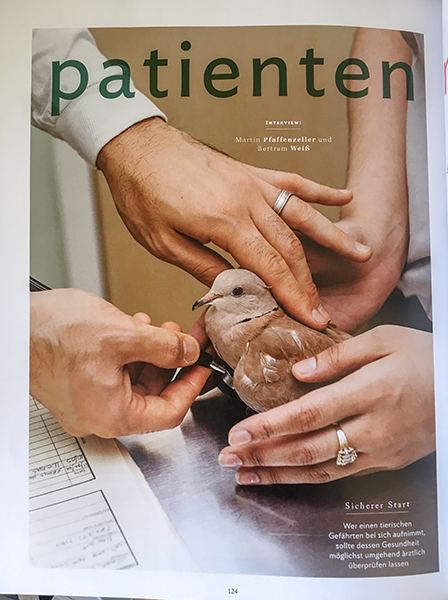 As a result of navigating through several links, I came across The Center for Avian and Exotic Medicine in NYC, and it struck a cord. 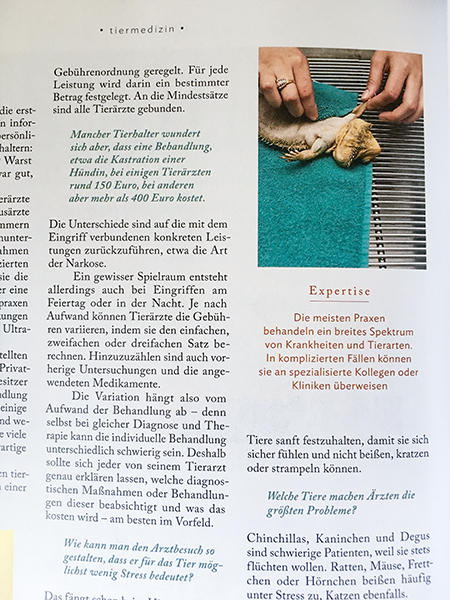 I contacted the A&E about my project idea, which was to document the experience of exotic animals, (defined as anything other than a cat or dog) that come to the Center for treatment. Their response was receptive, and supportive. I first began by calling the Center ahead of time, to ask what animals were scheduled for visits that week, so as not to be faced with a circumstance where there were few appointments that day, repeats of the same animal, or appointments that were spread far apart during the day. I soon abandoned this approach, learning that as in life, it’s the unexpected that often shows up and proves to be more interesting, that is, if you are patient, open, and aware. It was in those serendipitous visits, that the most interesting events occurred. Often times there were walk-ins that ended up being the most intriguing cases. As with anything, I had good experiences that left me filled with hope and promise, and at other times, I experienced things that left me feeling quite the opposite. 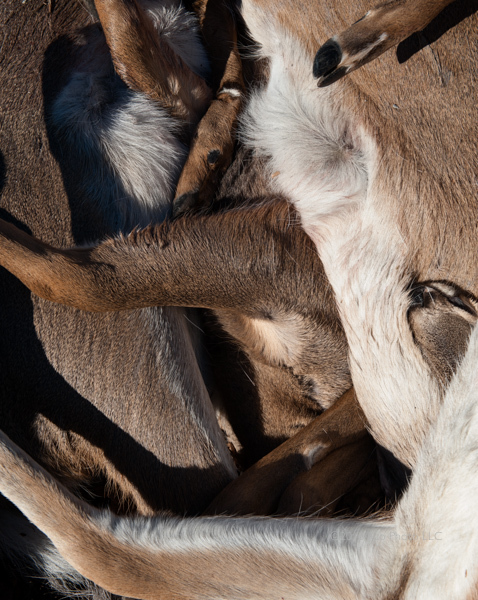 Humankind’s relationship with the animal kingdom, is one that is complex and multifaceted. There were many responsible owners who kept up with regular wellness visits––showing up at the slightest concern when something seemed amiss with their pet. There were also times, where the opposite was true. Owners that were weary of coping with illnesses and the expense of treatments required for the maintenance of their pet. 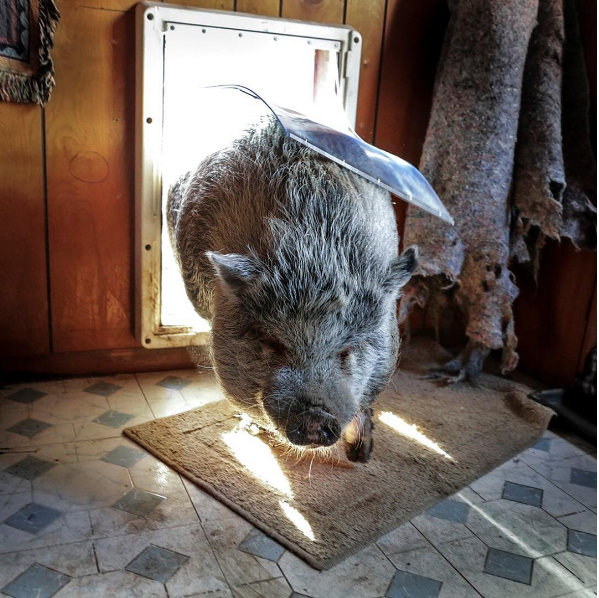 Often times these owners lacked the initiative to research their pets needs, or were unable to meet the demands those requirements entailed, or had poor husbandry practices. Sometimes these pets were relinquished to the Center, and if possible rehabilitated, sometimes adopted by the staff, or put up for adoption. 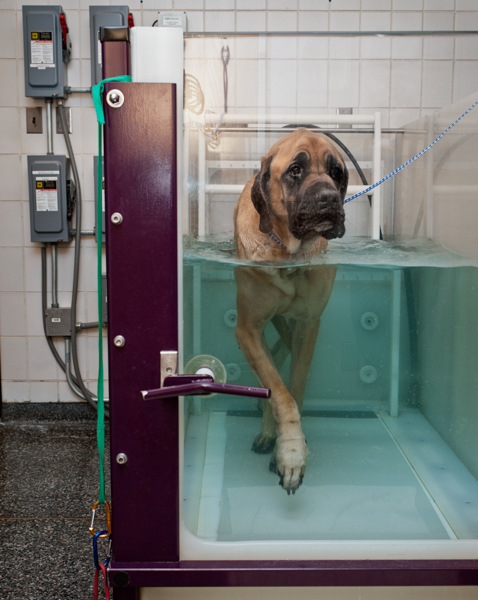 The project’s focus, is on the Center itself, and the trials and tribulations they must endure to bring these pets back to wellness to the best of their ability. They are a compassionate and dedicated staff. They are fully devastated when they lose a patient––reconstructing the event in their minds, in futile hopes of coming up with a different conclusion. The animal is their primary concern, and they do everything in their power to advocate on behalf of their patient. The Center consistently dispenses educational information to their clients and the public, on how to best care for their pets. The staff themselves, own several rescue exotic pets. My projects use animals as a vehicle to illustrate global social environmental issues. It is not just about the animals alone. According to The Humane Society of the United States, the exotic pet trade is a multi-billion dollar industry, second only to drugs and weapons on the black market. Business is conducted over the internet and trade magazines and shows, resulting in a $15 billion dollar business in the US alone. These illegally imported animals do not end up only as household pets, but often used for entertainment purposes in a circus or zoo. My project illustrates a small glimpse into the consequences of humankind’s thirst for the exotic. The practice of importing exotic animals as pets, has been happening for decades and is often ignited by a fad, brought on by the entertainment industry. The T.V. show “Teenage Mutant Ninja Turtles,” created a surge in popularity for exotic turtles. People seeking exotics as pets, often incorrectly assume that acquiring one means less maintenance than owing a dog or a cat. People with busy lives, living in small apartments, often seek out an exotic for this reason. 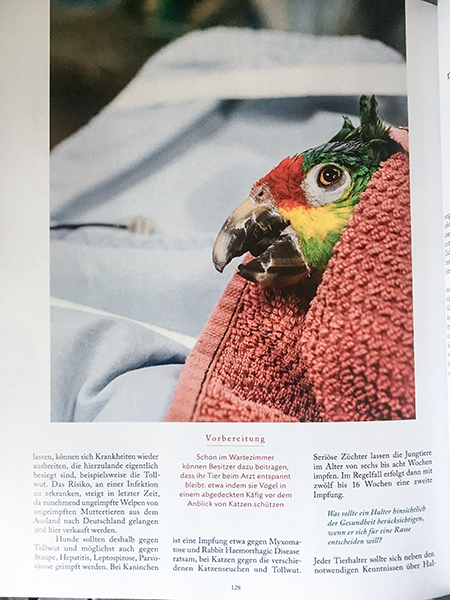 This is not the case, as exotic animals have very specific needs, and their veterinary costs can be significantly higher, due to their increased specialization. Even animals born in captivity, retain their natural instincts and behaviors. It is simply unfeasible to meet their ecological and biological needs. 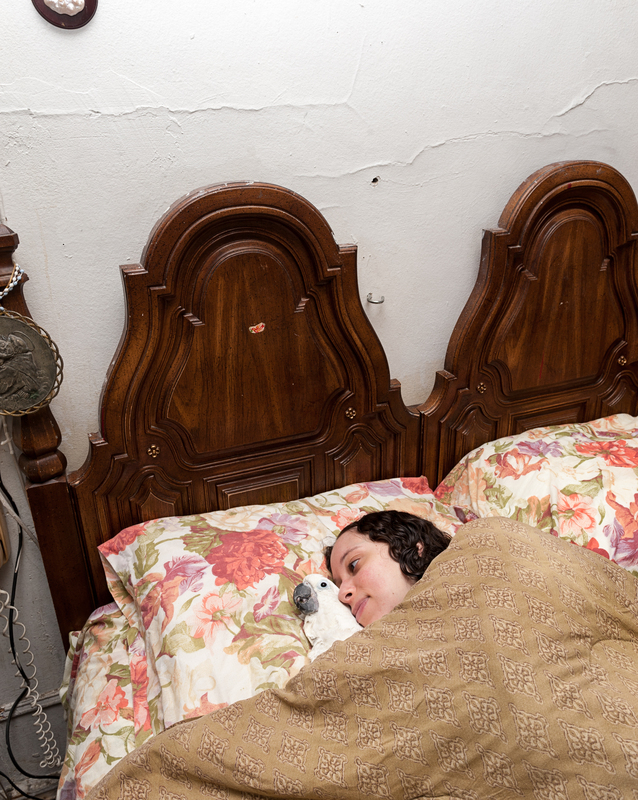 Difficulties in adequate housing, social environment, and atmospheric conditions such as temperature, amount of sunlight, and unvaried diets, result in illness, and often times death. 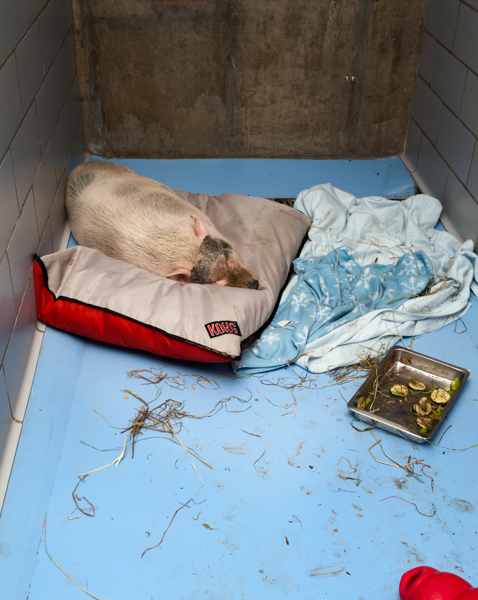 Animals who have been removed from their natural habitats often experience so much stress and shock from being removed from their home, that they die before they even reach their new destination. Infant animals are the most desirable, and often times the mother is killed by poachers so that it’s easier to capture her babies. Removal of certain species from the wild, poses a threat to environmentally sensitive areas such as the rainforest or the African plains. The extraction of these animals from the wild, is with dire consequence as these delicate ecosystems heavily rely on animals to carry plant seeds through their droppings and fur. Moreover, the delicate ratio of prey and predator is compromised, which is necessary to keep populations in balance. There has been some inquiry, as to what is taking place in some of the images in the project so I have provided additional information in the select images below. The purpose behind my projects is to use animals as a vehicle to create awareness about global environmental issues. My work comes from a place of advocacy and reverence, in hopes of generating deep consideration for our environment, and other sentient beings. 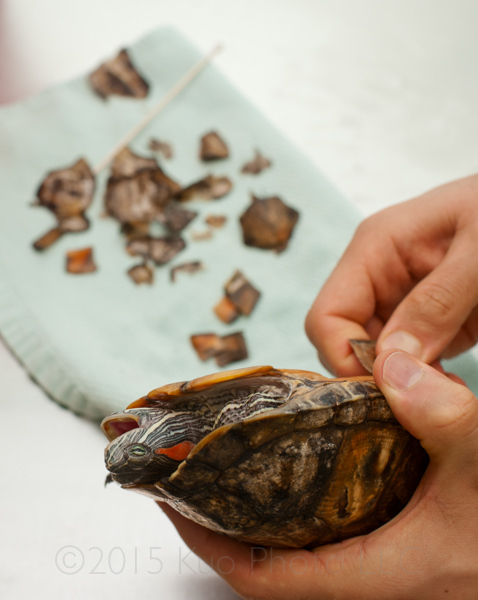 Red-Eared Slider having scutes removed. Supposedly this does not cause the animal pain, outside of the stress of being handled and going through the process. Most common factors that contribute to shell problems are related to water and diet. Lack of proper basking areas for the turtle, lack of calcium, or excessive protein. Also, appropriate lighting. UVB bulbs are required and must be changed out regularly. These conditions often take a long time to heal, and may require intensive care. 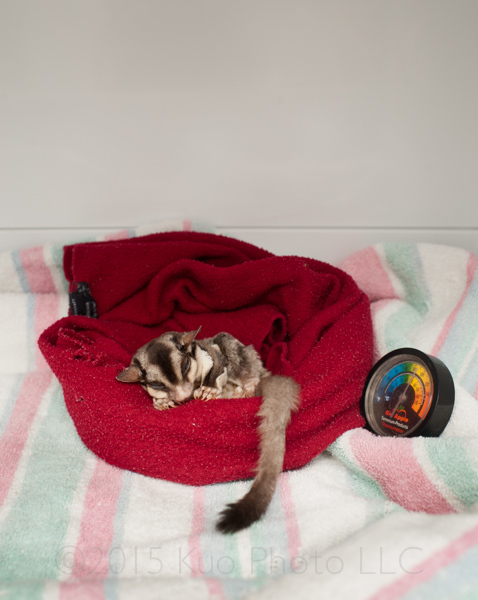 This tiny sugar glider, was in intensive care during one of my visits, and sadly did not survive. They are native to Australia and Tasmania, Papua New Guinea, the Archipelago and certain aisles of Indonesia. They are found in forests and eucalyptus trees. They are nocturnal, and feed on the sap of certain of species of trees, namely eucalyptus, acacia and gum trees. They are arboreal, meaning they spend most of their lives in trees. 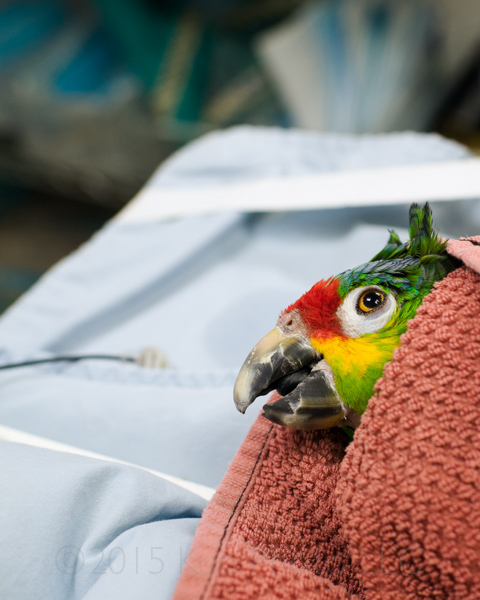 This is Anthony, an Amazon parrot who came in for his fourth tumor removal, which was benign. It is unclear as to whether he would have developed these tumors in his native habitat. (South America and Mexico and the Caribbean.) In his own environment, it’s possible they might not have developed at all, possibly dried up and fallen off on their own, or removed by fellow bird. 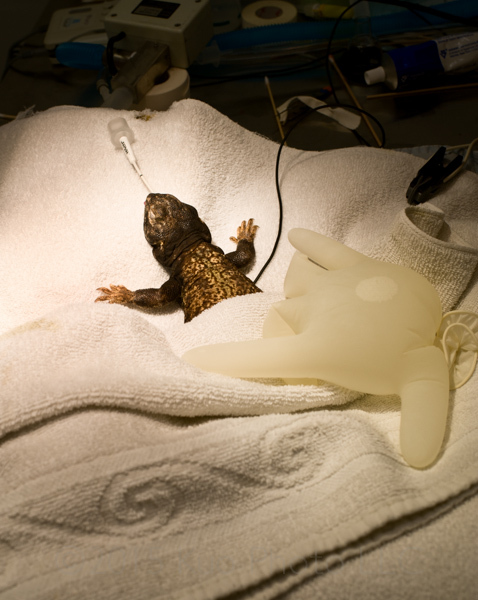 “Mystix” an Egyptian Uromastyx lizard post operation. The surgical glove is filled with warm water to maintain his body temperature. “Mystic” ate a foreign plastic object. This is often misconstrued as the lizard being curious, and therefore eating something he should not have, as a result. However, often times it’s a symptom that he is lacking nutrients in his diet. This entry was posted in news and events on March 22, 2015 by Kuo Photo. 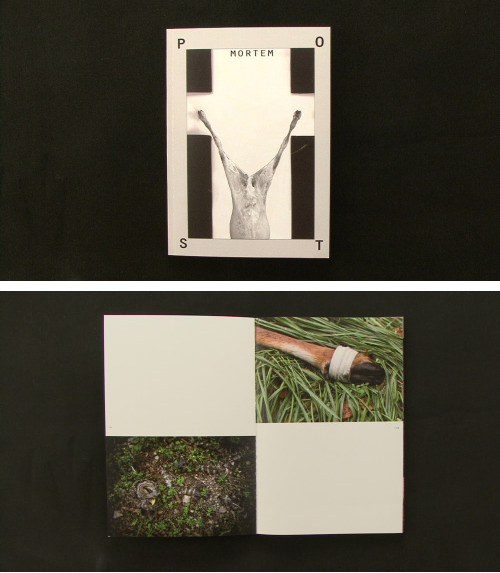 I’m pleased to have work from my project “Hit and Run” featured in Otto di Paolo’s, zine entitled “MORTEM.” The book, exhibits different approaches and views, of dead animals. When I set out to photograph my project “Hit and Run” I had the opportunity to shoot it in a sensationalized manner, which is not how I felt about the subject matter, and not how I set out to approach it. However, in the creative process, I feel it’s important to be open and to explore all avenues and all approaches, because often times something is revealed by taking a path, that you had not intentionally set out to take. Recently, I attended a portfolio review and one reviewer and I, were not a good match. We were not on the same page, let alone the same book! However, I found the experience valuable as it reaffirmed my instinct to not pursue a direction I was contemplating, but unclear on. Therefore, every experience exists to teach or reveal, even though it’s purpose may not be evident to us at the time. Regarding di Paolo’s zine, it was interesting to see other artists interpretation of dead animals, and to contemplate my own feelings and reactions to their views, given my bias towards the subject matter. I felt many times the animals were being objectified, or documented scientifically as a still life-an object, vs having been represented as a previously living breathing sentient being. Material which lends itself for much contemplation in the complex relationship between humankind and the animal kingdom. This of course, was my own personal interpretation. That being said, an interesting compilation and beautifully produced book. This entry was posted in news and events, projects on February 25, 2015 by Kuo Photo. 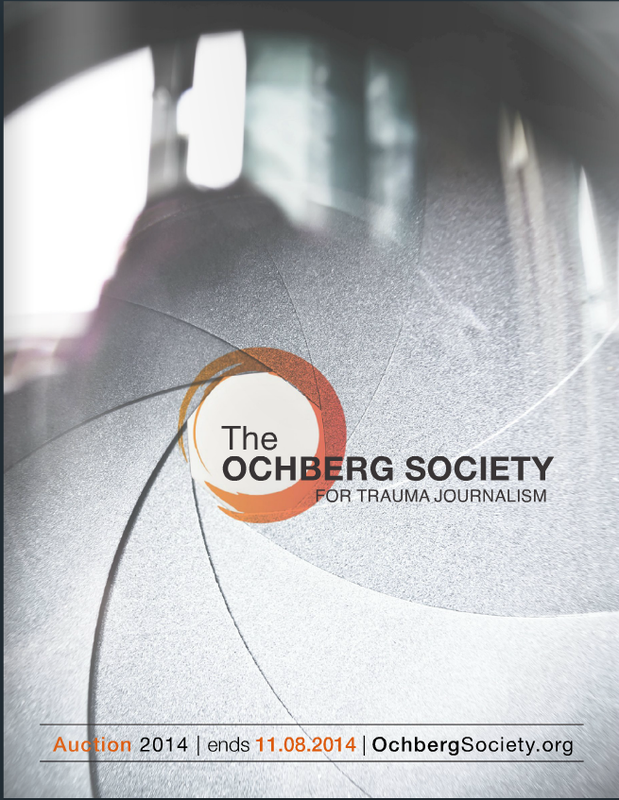 I’m pleased to be participating in The Ochberg Society’s annual auction for trauma journalism. 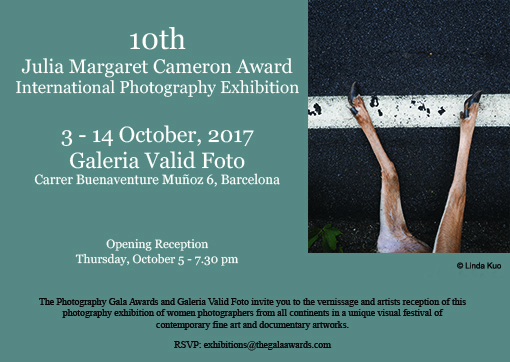 Proceeds from the auction will help support photojournalists who cover conflict and social injustice. 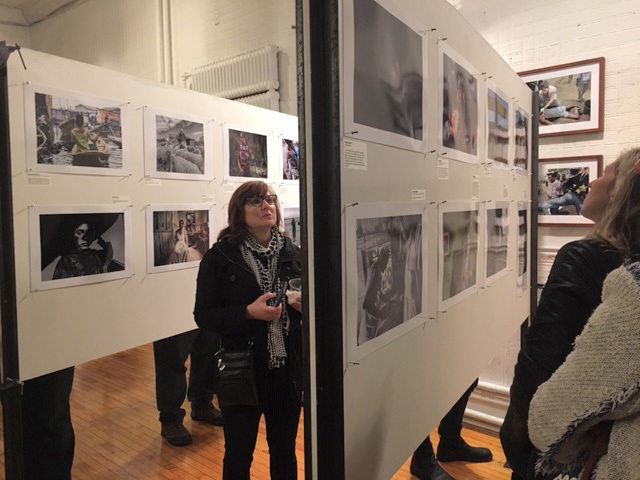 You may view the works of over 50 photojournalists in the online auction by viewing the auction catalog. The catalog is also available for purchase. The auction begins on October 25th and ends on November 8th. Happy bidding! 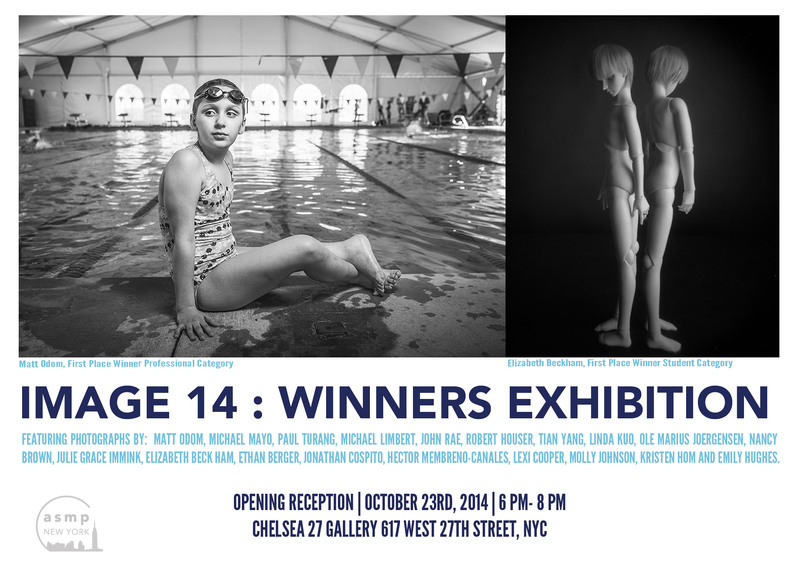 This entry was posted in news and events on October 17, 2014 by Kuo Photo. This entry was posted in news and events on October 9, 2014 by Kuo Photo.